The sugar industry pulled the plug on an animal study it funded in the 1960s. Initial results pointed to a link between sugar consumption and elevated triglycerides, which raises heart disease risk. 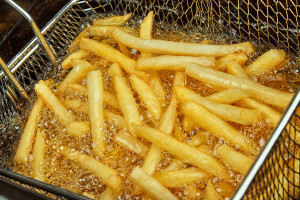 In 1956, a major cooking oil company published a series of magazine advertisements claiming that “fried foods become light foods” when vegetable oil is used in place of butter or lard. The clear message to health-savvy homemakers was that vegetable oil was a low-calorie solution to the more traditional fats they were cooking with. Millions of well-meaning cooks took the bait and made the switch, thinking their families would be better off as a result. So-called “heart healthy” cooking oils (i.e. soy, canola oil (rapeseed), cottonseed, sunflower, and corn) just so happen to be among the leading causes of heart disease and cancer in America today. Most consumers have no idea that they’re being duped.